There are indications that the Chinese version of EVE Online might be about to take an unusual approach to punishing players who cheat in the game. Rather than simply banning players who are discovered botting or otherwise illicitly playing the infamously challenging space-sim, rogue captains may find themselves breaking asteroids in space-prison. 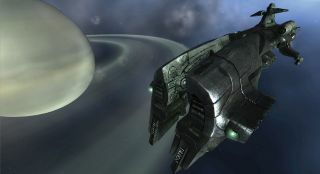 Kotaku reported that data-miners from Holobreakers—a site dedicated to unearthing EVE Online changes on the game’s test server—discovered a bunch of new in-game dialogue strings, which revolve around cheating players being required to perform “menial labour” themed in-game tasks in order to regain the freedom of their avatar. In addition, the data miners also claimed to see a new type of ore mentioned that has no practical use, and exists purely for the sake of being mined. In other words, cheaters will be forced to mine a certain amount of pointless ore before being allowed to play the full game again. Initially, CCP announced that it was making changes to the test server for both the International and Chinese versions of the game. However, after enquiry by Kotaku for comment, CCP clarified that the changes were intended only for the Chinese market. This year CCP has partnered with the Chinese Internet technology company NetEase. That local version of EVE Online will be “synchronized” with NetEase’s existing Guardhouse System, which punishes cheaters in NetEase games in a similar fashion. It’s certainly a novel way of dealing with the seemingly neverending problem of cheating in online games, and entirely fitting with EVE Online's weird and uncompromising approach to play. My only question is what happens if a player hacks Guardhouse to automate the menial labour? Do they then get sent to space-solitary, or are they sentenced to death via airlock?